I love purple so much that from 15 to 22 or so, I only wrote in purple ink. I’d still be doing it, but I’m also a mite obsessive about pens, and found a pen that I can’t live without that doesn’t have a purple version. I still try out purple pens from time to time, though. I even found one a few years ago that had sparkles in the ink (*squee! *), but it dried out too quickly. I love purple so much that I have a hard time telling if something (a dress, a building, a design, an extraterrestrial) is attractive or not if it’s wearing purple. I’ll automatically adore it, and have to remind myself to be more objective, though sometimes I can’t help but love it for being purple, anyway. As a result, I don’t wear a lot of purple, for fear of choosing terrible styles and being none the wiser. 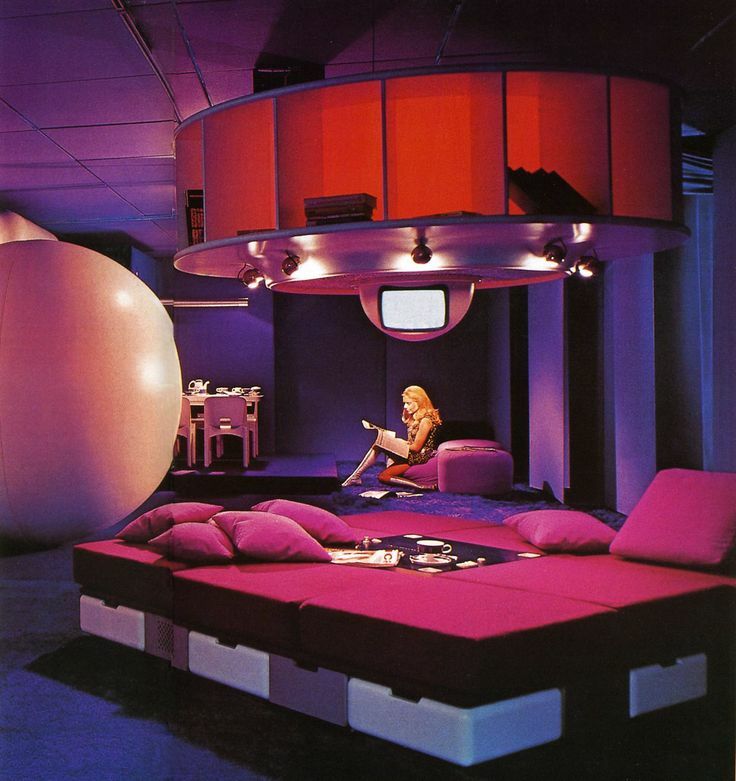 Vintage 60s Interior. Prototype of “Visiona 1 Futuristic Habitat”, Central Living Block. Designed by Joe Colombo. I even love purple so much that for a couple of years, I was quite convinced that Gogol Bordello’s “Start Wearing Purple” was the best song I’d ever heard. Now don’t get me wrong – I adore Gogol Bordello. They’re pretty rare in that I love all of their songs, and can listen to an album from beginning to end, no skipping around. Lyrically, I’ve always been impressed by the social messages in most of their songs, and it’s hard not to love the sound if you’re into that kind of thing. I tend to dig the Gypsy Punk mix of punk rock sound with the Romani-inspired accordions and violin (and in the case of other Gypsy Punk bands, a brass section). Even better, their live shows are amazing. The whole crew goes balls-to-the-wall, with so much energy it’s exhausting just watching them go batshit on stage. I’ve been lucky enough to catch them in concert twice in the past few years, once in a pretty big theater, and once in a tiny bar that had about 150 people. I was so close to the stage that Eugene could have sweated on me were I that interested in getting close to a stranger’s bodily fluids. Despite the beauty of my past memories of Gogol Bordello, and the fact that I’m currently wrestling with whether I can afford to buy tickets to their show this Friday, I’m coming to terms with the fact that this just isn’t my alltime favorite song anymore. I think that they’ve been replaced in my heart by my current favorite band, scheduled for a #MusicMonday mention in two weeks’ time. Challenge Update: Diamonds Out, Trekking Supplies & Workout Leggings In!